This section contains a number of newspaper and magazine articles that have been written over the years about the brothers. Genealogy charts, which trace their heritage back to Moravia, are available on a separate Genealogy page. A newspaper article about Ferdinand entitled "Art With Lasting Value" by Sidney R. Weisiger was published in The Victoria Advocate, Jan. 28, 1973, and can be viewed here as a PDF document. An article by Ferdinand Pribyl's great-grand-niece, Bette Stockbauer, was published in the Fall 2007 edition of Kosmas, a peer-reviewed, multidisciplinary journal that focuses on Czech, Slovak, and Central European Studies. It is published bi-annually by the Czechoslovak Society of Arts and Sciences (SVU). Kosmas is not available online, but in hardcopy by subscription only and information on the journal and subscriptions may be found here. Bette's article, entitled "From Frenštát to Fayette County — A Chronicle of Two Brothers: Jan and Ferdinand Pribyl", uses original correspondence from Jan, her paternal great-grandfather and his brother, Ferdinand, to paint a picture of life on the frontier of Texas and the old country of Moravia at the end of the 19th century. The article may be viewed here. Special thanks are due to Dr. Robert Shook and Bob Allen of Victoria College who photographed and digitized some of the images of Ferdinand Pribyl's work displayed here. Dr. 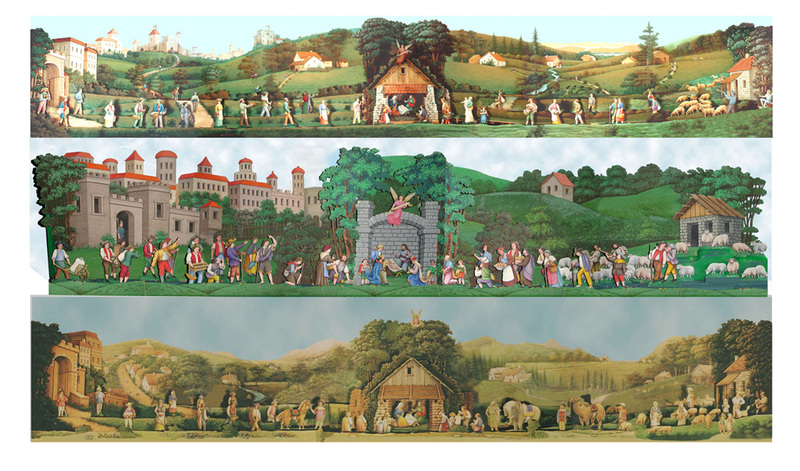 Shook has also prepared a photo showing three of the Pribyl Bethlehem scenes. All rights reserved – 2010. Website by James Harris & Bette Stockbauer-Harris.